Writing the history of Roundup is like trying to describe the atom bomb in Sanskrit - its value, origin and development are simply too vast to be encompassed in the written word. So with this apologetic beginning, we'll attempt to present a brief account of the Fish Wrapper. How Roundup was ever conceived no records indicate. The best authority on that could be in the words of the CBI's first Commander, Gen. Joseph W. Stilwell, who wrote the following in Roundup's second issue on Sept. 24, 1942. "The main purpose of this paper is to keep the command informed of what is going on at home and in the other theaters of war. We are a long way out, the mail is slow, and all censors are crabs, so Roundup should help materially to fill in the gaps. It's your paper, so feel free to contribute to it. If you have a gripe, write a letter to the editor. If you can run the paper better than he can, tell him so, but watch out that he doesn't put you on the staff and make you prove it. He is looking for ideas and if he can't find them, the Roundup won't be quite what we want it to be - the most readable sheet in the far East..."
The first issue of Roundup appeared Sept. 17, 1942, the first overseas theater newspaper in World War II. Capt. Fred Eldridge, formerly of the Los Angeles Times, was the first editor and in this initial edition he stated Roundup's policies as: "The C.B.I. Roundup is your newspaper. It is written for you, by you and filled with news and pictures all of which have been either procured originally or edited by Army personnel. Whether or not, chums, this little sheet ever becomes worthy of wrapping Friday's fish will depend in a large measure on your interest. Your stories and pictures are sought. Your letters of criticism or praise are eagerly solicited. "Our policy generally will be a preoccupation with the lighter things of life. We're constantly looking for laughs and we'll pass them on to every American soldier in China, Burma and India as fast as they come to us. We will print every scrap of sports news we can get from the home front. Our curiosity concerning politics back home and about such Americana as the marriage of Gypsy Rose Lee will be unquenchable. "To the best of our ability we'll keep our columns free from propaganda - unless it be Axis. We'll run some of the Hirohito-Hitler boys stuff from time to time for the laughs. It should be understood, however, that some stories are propaganda, yet very newsworthy at the same time. "Our name came after casting about for already three months. You should have heard some of the things suggested. To make a long story short, there was a meeting of the minds with the result clearly emblazoned on our masthead. It's traditional with the birth of a newspaper to explain the great significance of the particular name chosen. It has always been difficult for us to be "significant" about anything. However, C.B.I. means China, Burma and India. The design in the masthead is a copy of a new shoulder patch carrying the Kuomintang Sun and the Star of India. "In journalese a 'roundup' is the gathering together of odds and ends of news and boiling it all down into one component part. It reminds us of the days when we used to send in roundups on purse snatchings, rapes and children burned on the Fourth of July. They were often the real guts of daily history. "We hope to gather together news from all ends of our theater, from the Office of War Information (OWI), from the U.S. war correspondents, from gleanings gathered by our radio monitors of the 10th Air Force, from our own little body of hand-picked men, and put it all together into a five-column, eight-page tabloid evil enough to make you chuckle and clean enough to get through the mails." Thus Roundup began. Whether it has done all it set out to accomplish may be a debatable point, but the effort, the inspiration, and the men were there to at least try. 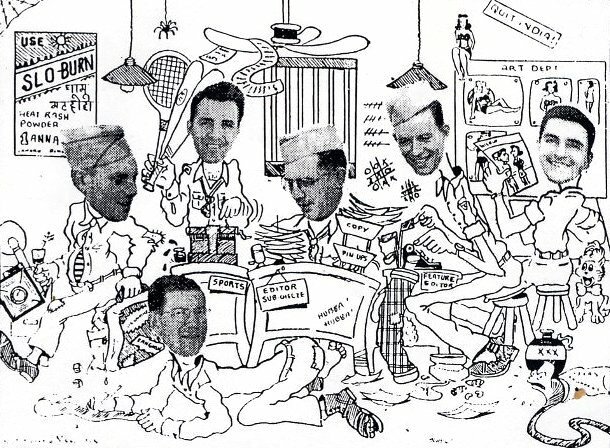 Eldridge's original staff was composed of Lt. Luther Davis of the 10th Air Force, who wrote the weekly War Warmed Over column, T/5 Jack Nolan, staff artist, and Sgt. William F. Cox, staff photographer. Circulation since the beginning was based on one copy for every two men in the Theater. Capt. V. Slater of SOS began the job, later taken over by Lt. Sid Rose, Lt. Boyd Sinclair, and Capt. Drexel Nixon, in that order. Distribution caused many headaches in this theater of so many varied and difficult transportation means. Every way possible has been used - air, rail, jeep, train, truck, civilian mails, boat, river barge, bullock cart, and even combat cargo air drops have carried Roundup to GI's fighting behind the lines. Distribution to China was made over the Hump to Kunming. From there, distribution was, at best, uncertain. The peak of circulation was reached in the fall of 1945 when 120,000 copies were printed each week: 20,000 in the Delhi area and 100,000 in the Calcutta area, which supplied the intermediate and forward areas. This peak has, of course, gradually declined since V-J Day and the subsequent decrease in Theater personnel. Up to the present time, approximately 6,000,000 copies have been published. The third issue jumped to 12 pages with the column length remaining at 15½ inches. Additional members were recruited to the staff as circulation increased. In January 1943, Lt. Clancy Topp replaced Eldridge who transferred to the European edition of Stars and Stripes. In April, Topp transferred to the Chinese Expeditionary Forces in India to become Public Relations Officer and was replaced by Lt. Floyd Walter, formerly Assistant Editor. Besides the display of current news and staff articles, a variety of regular columns were sprinkled through Roundup. The War Warmed Over condensed the week's war news into comprehensive reading; Broadway At Vine gave current sidelights in the entertainment world; Briefs From The Brambles rehashed the best from camp newspapers within the Theater. Quirks In The News gave oddities in the news; Words From The Weeds was the letters-to-the-editor column from Theater GI's; Names In The News presented personal items about people in the world's news; and later a critical review of new 16-mm overseas movies was presented in Your New Movies. The Sports Roundup column offered editorial opinion and out-of-the-way sports coverage. One of the most popular and identifying features of Roundup was the generous and discriminating "cheesecake" - photos of lovely ladies in eye-catching poses. Some have aroused criticism but in general they served the two-fold purpose of livening the pages and reminding GI's that beautiful American woman-hood still existed. Virile headlines like "How's Your Girdle, Myrtle?" and "Thomas Dewey Called A Liar" to "Bed Bug Battle Nears Climax" and "Sky-High Prices in India Justify Wages of GI's" dotted the pages. Columns by such professional writers as Henry McLemore, Clare Booth Luce (Roundup was the only GI paper she ever wrote for), Drew Pearson, and special articles by war correspondents such as Darrell Berrigan of the New York Post and Paul Feng of the Chinese Central News Agency appeared at times. Truly, Roundup's news sources were varied and unpredictable - the purpose to bring the news to GI's was nevertheless fulfilled. Several staff articles received special notice in the U.S. Perhaps the most world-shaking story was the one attacking the USO Camp Shows in general and Ann Sheridan in particular. Its author not to be revealed, the article, appearing in the Sept. 28, 1944 issue under the headline, "On Hollywood Entertainers - A Gripe Is In Order," quoted Miss Sheridan as saying, upon her return to the U.S. after a brief stay in the CBI, that she did not wish to come back because "It is too rough." The article protested such shows, as that of Sheridan et al, who spend "a total of 35 days out of a promised minimum of 60 in CBI, pick up a little money and a lot of publicity, and sneak back to the States to recuperate from the whole horrible ordeal." Other troupes such as Joel McCrea, Joe E. Brown, Paulette Goddard and Al Jolson came under attack in the same article, and Hollywood seethed in indignation for weeks. We doubt if Miss Sheridan today would hesitate to crown anyone who mentions the Roundup in her presence. S/Sgt. Karl Peterson's humorous account of a GI's impression of a cricket game was republished in a Stateside magazine. Sgt. Fred Friendly's interview with Stilwell on Okinawa after V-J Day giving "Uncle Joe's" definition of a GI was reprinted in many U.S. newspapers as well as Sgt. Charles Kellogg's "Christmas by the Crosses" a poignant story of a Burma Christmas in peacetime. Other stories too numerous to mention have appeared in many U.S. newspapers and magazines, and more than once in the Congressional Record. T/Sgt. John Derr, Roundup's sports editor, caused much comment when he flew to and from the States to personally cover the all-St. Louis World Series in 1944. Friendly I and E wallah who wrote many special articles for Roundup, made a name for himself touring the ETO interviewing Gen. George Patton when the American and Russian forces joined in Germany; not to mention his travels in China, Manchuria, Japan, Okinawa, and the Dutch East Indies. There are numerous little-known things that have been done for Theater G.I. 's by Roundup such as the sending of two pair of extra large sized service shoes to an ailing GI "up in the weeds." Perhaps the most outstanding project done on behalf of the G.I. 's here was the successful campaign started by Roundup to eliminate the import duty tax that was levied during the early months of the CBI Theater on packages sent home. Duty was even charged on Christmas packages Theater G.I. 's mailed home in 1942, but the bill was passed in December of that year after a War Department spokesman declared that the Roundup was "off base in that the tariff was a matter of law and the Treasury Department had nothing to do with it." Little known also are the many handicaps overcome each week in getting Roundup to press. Published by the Statesman in New Delhi and Calcutta, the Roundup is locked up in the forms on Tuesday of each week after much proof-reading and wrangling with Indian printers and compositors, whose journalistic techniques don't often coincide with that of the Roundup staff. After these differences are smoothed, three mats of each page are rolled, one remaining for the Delhi edition, the other two flown to the Statesman's Calcutta office for the edition to be printed and distributed to the remainder of the Theater. Occasionally these mats have wound up in Karachi or have gone over the Hump, or simply disappeared altogether. Consternation reigns temporarily on such occasions, but new mats soon replace the lost ones. In January, 1945, shortly after the CBI was separated into the India-Burma and China Theaters, distribution of the Roundup in China was discontinued, being replaced there by the China Lantern. It is interesting to note, however, that untold individual requests for copies of Roundup were frequently received from China troops. Until March 2, 1945, Roundup had operated as an independent staff section of the Theater Headquarters. On that date, personnel and functions were assigned to the Theater Information and education Section. During peak production, the staff was composed of two officers and six enlisted men. The two officers were the Editor and Associate Editor while the Assistant Editor, Sports Editor, Staff Artist, Staff Correspondent, and two Staff Writers, in over-lapping duties, were enlisted men. The Assistant Editor not only aided the editors, but also had general duties similar to a "star reporter." The Staff Correspondent was continuously on tour covering special assignments first-hand. The artist retouched all photographs, made illustrations and cartoons. Staff Writers wrote special features, handled rewrites of world wide wire copy, assisted in writing headlines, edited copy and proofs, and wrote regular columns. various writers in Public Relations offices throughout the Theater served as field correspondents who sent in spot news and features. Here's our artist's interpretation of the last Roundup staff. At left, our roving reporter, Ed Alexander is hurrying off to some distant unknown spot. He's never drawn a regular paycheck. Behind him is Carl Ritter, our Sports Editor, usually buried in sports statistics. On the floor in front is Warren Unna, whose arguments with the Indian printers create heat rash for all. In the center is Chet Holcombe our burra sahib editor, deciding which pin-up to publish. Beside him is E. Gartly Jaco, bleary-eyed from too many movies, pounding out his column (but we know it's a letter to his home in San Antone). At the far right artist Jimmie Menutis is thinking up a Wilbur gag amidst his "art." We hope you're not too disappointed. A significant change in Roundup's policy came in November 1945, when T/Sgt. Art Heenan took over as the first enlisted man to edit the paper. Since then enlisted men have entirely edited and produced Roundup, similar to the policy of YANK - The Army Weekly, which made that publication famous. Besides Stars and Stripes, Roundup was the only other newspaper mentioned in Gen. George C. Marshall's Biennial Report to Congress on the war last fall. Roundup's editors, in order, have been: Capt. Fred Eldridge, of Los Angeles; Lt. Clancy Topp, of Wahoo, Nebr. ; Major Floyd Walters, San Francisco; T/Sgt. Arthur Heenan, Syracuse, N.Y.; M/Sgt. John C. Devlin, New York City; M/Sgt. Charles W. Kellogg, Canaan, N.Y.; and T/Sgt. Chester S. Holcombe, Avon, N.Y.
Staff members of Roundup have been: Capt. Luther Davis, New York City; Lt. Richard McClaughry, T/Sgt. Jack Nolan, Brooklyn; Cpl. Roger L. Wheeler, Poteet, Tex. ; S/Sgt. William Barnum; Sgt. Edgar Laytha, New York City; Sgt. Al Sager; Capt. Boyd Sinclair, Austin, Tex. ; Capt. Crosby Maynard, Washington, D.C.; S/Sgt. Karl Peterson, Kansas City; S/Sgt. Charles W. Clark, Fort Worth, Tex. ; S/Sgt. Ralph Somerville, Los Angeles; Sgt. Wendel Ehret, Los Angeles; S/Sgt. E. Gartly Jaco, San Antonio, Tex. ; Sgt. Michael J. Valenti, Brooklyn; Sgt. George Gutekunst, Mt. Vernon, N.Y.; T/Sgt. Edwin Alexander, Seattle; S/Sgt. Warren Unna, San Francisco; S/Sgt. Jimmie Menutis, Houston, Tex. ; T/Sgt. John Derr, Greensboro, N.C.; S/Sgt. John R. McDowell, Sierra Madre, Calif.; T/Sgt. Carl Ritter, Ashtabula, Ohio. Holcombe, Alexander, Jaco, Ritter, Unna, and Menutis form the present and final Roundup staff. For those we missed, please forgive us. So many contributed to Roundup's columns that a complete list is impossible but nevertheless vital to its history. Very valuable assistance has been given by Nathu Ram Jain, civilian employee of Delhi whose attendance to clerical worries and a miscellany of other details saved many gray hairs and wrinkled brows. It may seem ambiguous on my part to be writing this story of the history of the Roundup. I wonder at the untold number of times the Roundup's past editors must have visioned of writing this very story - the story of blood, sweat and tears to make men in the CBI laugh, cry, wonder, whistle, smile, speculate, think, be entertained and informed. Only those staff members here when the war was at its worst in 1942, '43, and '44 could and should write this story of the oldest overseas theater newspaper of World War II, and, in our humble opinion, the finest. Copy of CBI Roundup provided by Lowell Simpson and shared by Virginia Dyer.